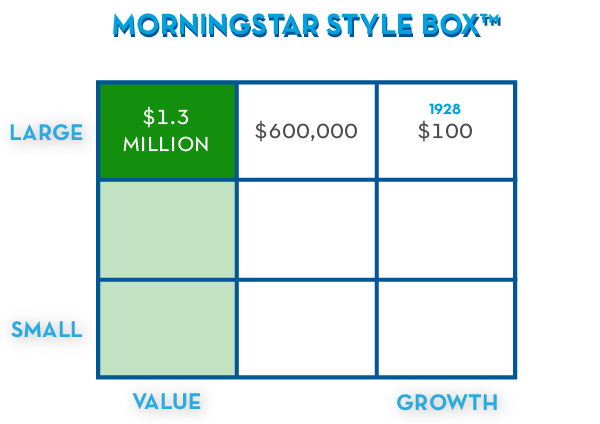 Explaining Value Stocks vs Growth Stocks | Pure Financial Advisors, Inc. The age-old debate of value stocks vs. growth stocks is like Coke vs. Pepsi. There’s no right or wrong answer. Some people like Coke, some people like Pepsi. It’s a matter of individual choice. Growth and value are similar in that some people prefer growth, some people prefer value. In some market environments, growth stocks do better. In other market environments, value stocks outperform. We will be discussing why the best approach is to combine both growth stocks and value stocks. 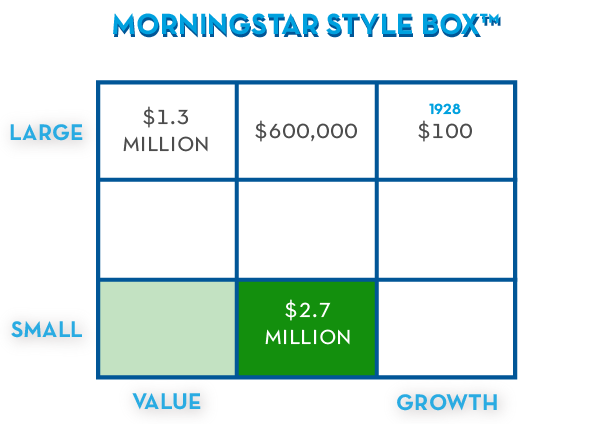 For starters, what are growth and value stocks? A growth stock is a company with a rapidly evolving business model – today that would be Google, Amazon, or Tesla, for example. Their profits and sales may be increasing rapidly, but in exchange for this rapid growth and prospects of future gains, you pay a higher price. Value companies are usually not growing as quickly as growth companies. Their business models may be older, they generally have less exciting growth prospects, and they are in industries that may be considered more mature. Think of basic materials, telecom, or consumer products. These are industries that aren’t growing as quickly. Some of the companies are very established. Sometimes it may be dividend-paying companies that people are buying for the income, as opposed to the future prospects for higher prices. Learn more about Value Stocks: An idea whose time has passed? Which Performs Best? Historically, Value. Over time, value stocks have actually done better than growth stocks. This may be surprising when you think about an “industry of tomorrow” – maybe today that would be biotech or alternative fuels. Those companies may be exciting, they could be initial public offerings or new companies with exciting growth prospects and rapid rates of revenue acceleration. The problem is that price matters, and the price that you pay for that future growth and those future earnings is important. And oftentimes, investors pay too much for growth. Which Performs Best? Lately, Growth. Recently, the environment for growth has been fantastic. The last 6 or 8 years post-financial crisis have been a strong environment for growth companies. Investors around the world have been seeking increasing revenues and increasing growth wherever they can find it, and a lot of times it has come from companies traditionally considered growth companies. Additionally, a lot of companies that historically have been considered value corporations have seen their stocks move into the growth quadrant because of increases in their stock price. Why has this occurred? Because of dividends. Companies like Procter & Gamble and Verizon are traditionally value-oriented companies that pay stable dividends and they’re in mature industries. But there’s been a reach for income lately, so investors have bid up the prices of certain companies that pay dividends, driving them into the growth quadrant. The important takeaway is that neither growth nor value is good or bad. Companies can move from one to the other as their stock price or their business model changes. Thus, you want some combination of both growth stocks and value stocks in your portfolio. That being said, as I mentioned, historically value has done a little bit better than growth. And let’s examine what that’s looked like over time. 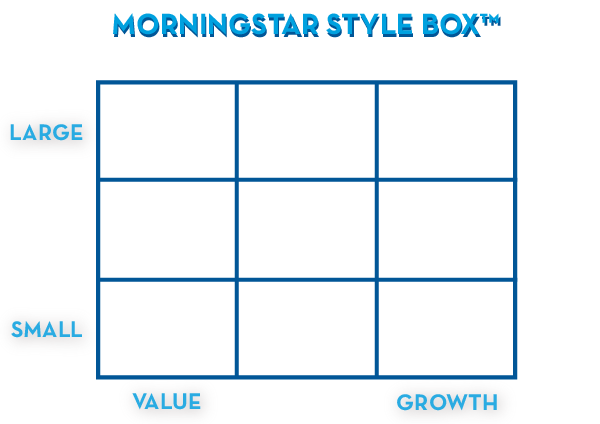 Across the top of this Morningstar Style Box™ chart are larger companies – big, mature S&P 500 style companies. Down at the bottom, we’re looking at smaller companies, maybe the Russell 2000. Across the left side are value companies, across the right are growth companies. Let’s look at historical returns. 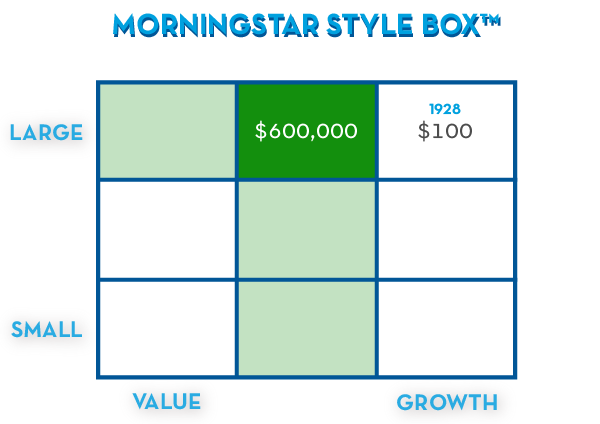 If we go back to 1928 and we invest $100 in the S&P 500, what would that have looked like? Think about where we were in 1928: one year away from one of the biggest stock market crashes in history, which was immediately followed by the worst depression of the 20th century. World War II. Eventually, Vietnam, stagflation, Watergate, leading into the tech bubble and burst, leading to the financial crisis, and now here we are today. Despite all of that, despite wars and famine and upheaval, times that were good and bad, our $100 invested in the S&P 500 continued to chug along. And remember, with this $100 we didn’t go out and try to buy individual securities, we didn’t try to buy the best securities, rather, we bought them all. And some of the companies in the S&P 500 did well and thrived, and others fell out of the index, while new entrants came in. But over time, that $100 actually turned into roughly $600,000.1 $600,000 from a $100 investment since 1928, invested broadly in the S&P 500, which is a mix of large-cap, both growth and value. Very significant gains – a product of the power of capitalism and growing corporate earnings. But remember, I mentioned that historically, value has done better than growth. So, let’s look at what the returns might have been if we had focused on value. Instead of buying all the large companies, including growth and value, we put that same $100, in that same timeframe, into only large value companies. In that case, that same $100 investment, instead of turning into $600,000, would have turned into approximately $1.3 million2 – more than double. One of the strengths of value companies overgrowth companies is their incrementally higher returns compounded over time. Compound interest essentially is, if I have a dollar today and I earn 10%, next year I have $1.10. If I then earn another 10%, I earn that 10% not only on my initial investment of a dollar but also on my 10 cents in prior gains. So next year, my gains aren’t 10 cents, they’re 11 cents. This process can resemble a snowball growing ever bigger as it rolls downhill, especially when we multiply it across very long periods of time. According to data from the World Bank, Americans born today are living, on average, nine years longer than Americans born in 19603. As our life expectancy increases, the idea of investing in the market over increasingly longer timeframes is certainly not out of the question. Let’s continue this thought process and say if our large companies have returned $600,000 and our large value companies turned into $1.3 million, maybe we look at small companies. 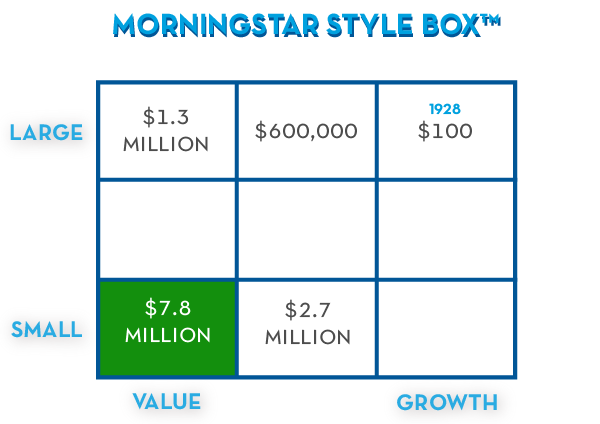 Whether we’re discussing value or growth, small companies, historically, have outperformed large companies. It turns out if we invested the same amount of money in small companies, it would have turned into approximately $2.7 million.4 Nearly four times as much by investing in the smaller companies, as opposed to the S&P 500. Now, if we focus instead on small value companies – so again, focusing on value as opposed to growth, but also adding in the fact that small companies tend to do better than larger companies, our $100 over that same timeframe would have turned into $7.8 million.5 More than 12 times as much money by focusing on smaller companies and value-oriented companies. Although growth and value both belong in a portfolio, ultimately, the empirical evidence demonstrates that a tilt towards value, as well as perhaps a tilt towards small companies, has produced higher returns over time. Remember: it’s great to have good prospects for your industry or your company, but you need to pay a reasonable price. Ultimately, the main determinant of your investment performance is what you buy, yes, but it’s also the price that you pay. Which Should You Own? Both. There’s an old saying in the financial markets: there’s no such thing as a bad security, there are only bad prices. Not to suggest that people go out on their own and invest in bankrupt securities, but there is an entire part of Wall Street whose only function is to buy bankrupt securities and bankrupt debt. And a lot of money has been made. Many of you may be familiar with Lehman Brothers, for instance, which went bankrupt during the financial crisis. A lot of money was made on their bonds because they fell to such a low price that there was then some value. If you paid 100 cents on the dollar for those bonds, they were not a good investment. If you paid 12 cents on the dollar for those bonds, they may have been a good investment. So again, price matters when you’re buying, not just bankrupt securities which are beyond the scope of what the average individual should be buying, but basic stocks and bonds, growth versus value. Yes, you want to own both, but ultimately, value tends to outperform, because price matters. That’s a little bit about growth and value stocks. Again, you want a combination of both in a portfolio. There are advantages to both. In the recent environment, growth stocks have performed better than value. Across most periods, historically, value’s been a little bit better, but not every year. Owning both of them, but with a slight tilt towards value, can produce higher expected returns in a portfolio. Higher expected returns in your stock portfolio can then allow you to take a more conservative overall asset allocation, which can provide the same expected returns, but with slightly lower risk. So again, the goal when it comes to investing and building a portfolio is to take risk where it’s being compensated, which is in the stock market, and then to own as many bonds as you can in order to support those stocks. And so, within the stock portfolio, identifying those factors that historically have led to higher returns, such as value or small, and overweighting those slightly, can produce higher returns within your stocks and better risk-adjusted returns within your portfolio. 1 – Dimensional Matrix Book 2017 Historical Returns Data – US Dollars, S&P 500 Index (1926-2016) total returns, page 13. 2 – Dimensional Matrix Book 2017 Historical Returns Data – US Dollars, Dimensional US Large Cap Value Index (1928-2016) total returns, page 27. 4 – Dimensional Matrix Book 2017 Historical Returns Data – US Dollars, Dimensional US Small Cap Index (1928-2016) total returns, page 33. 5 – Dimensional Matrix Book 2017 Historical Returns Data – US Dollars, Dimensional US Small Cap Value Index (1928-2016) total returns, page 29. Data presented in the growth of $100 above is for illustrative purposes. This growth assumes reinvestment of income and no transaction costs or taxes. An index is unmanaged and not available for direct investment. The historical performance of an index does not reflect the deduction of transaction costs, custodial charges, or management fees which could decrease historical performance results. Past performance is no guarantee of future results.